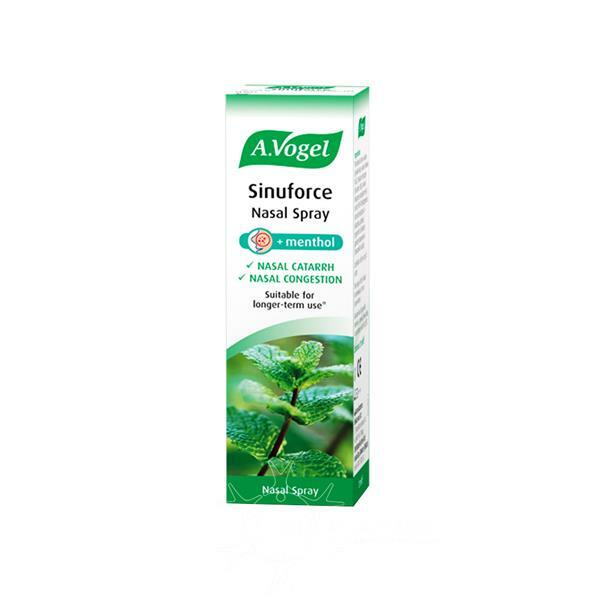 A.Vogel Sinuforce Nasal Spray with menthol provides rapid relief for nasal catarrh and a blocked or congested nose. It reduces swelling of the nasal mucous membranes, but leaves the natural protective function intact. Spray once into each nostril, 1-2 times a day for a period not exceeding 30 days. Spray once or twice into each nostril, 3-5 times daily for a period not exceeding 30 days. This product is not suitable for children under 2 years old. Physiological saline solution (purified water, sodium chloride (NaCl), disodium hydrogen phosphate-12H2O, sodium dihydrogen phosphate-2H2O); sorbitol; PEG-40 hydrogenated castor oil; eucalyptus oil (Eucalyptus globulus); peppermint oil (Mentha piperita); chamomile oil (Chamomilla recutita). Sinuforce is a registered Medical Device. Is this product suitable for me? Use Sinuforce Nasal Spray if your nose is blocked during or after a cold. Other symptoms may include a feeling that your sinuses are congested (possibly causing headaches), or catarrh sitting stubbornly in your nasal passages. It is also a good product to try if you are finding it hard to breathe freely through your nose, with symptoms affecting your sleep or ability to exercise. 1. Can Sinuforce be used for children? We advise not to use it for children under the age of two, and for parents to administer it to children under the age of twelve. 2. Can Sinuforce be used during pregnancy or breastfeeding? There are no restrictions on use during pregnancy or breastfeeding, but we advise pregnant women to consult their doctor or midwife before using any herbal products. This product should not be used by anyone who is allergic to any of the ingredients.